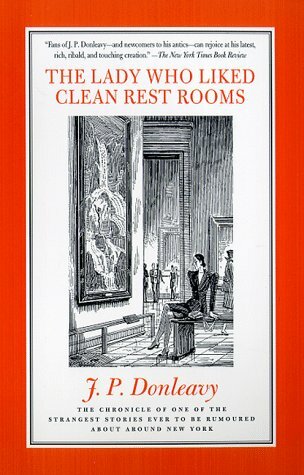 Not since The Gingerman has J.P. Donleavy succeeded in both delighting and irking his readers as he has with The Lady Who Like Clean Restrooms. This stylish novella tells the tale of Jocelyn Guenevere Marchantiere Jones, whose Scarsdale life comes to an abrupt end when her husband goes in search of a bit of "fresh flesh." Soon she is fending for herself in New York City, where finding a clean restroom will prove to be the least of her concerns. credibility as an author by trying to arrange for the book to be published in the UK and agreeing to alter the work to avert censorship. Donleavy is also an accomplished playwright as well as the scriptwriter, narrator and lead of the film/video J.P. Donleavy's Ireland. Donleavy's received several awards which include Most Promising Playwright Award, 1960, for Fairy Tales of New York; Brandeis Creative Arts Award, 1961&62, for the plays The Ginger Man and Fairy Tales of New York; Citation from National Institute & American Academy of Arts and Letters, 1975; Worldfest Houston Gold Award, 1992, for the film J.P. Donleavy's Ireland and the Cine Golden Eagle Award, 1993, for writer and narrator of the film J.P. Donleavy's Ireland. He was listed in the Modern Library's Best 100 Novels of the Century for "The Ginger Man," which also was ranked #7 in Best-selling Books of All Time in Ireland.